Vietnam’s southern metropolis, officially known as Ho Chi Minh City, may not have the picture-postcard charms of its northern counterpart Hanoi, but as a melting pot of cultures, cuisines, old meets new and East meets West, where shimmering skyscrapers rub shoulders with colonial-era mansions, it has much more to offer than many first-time visitors give it credit for. Here’s a rundown of how to make your trip to Saigon a success (just click on one of the links below to jump directly to the section you’re interested on). Vietnam’s tropical south experiences a dry season from November to April. The best time to visit is between early December and late February, when morning temperatures can start at a very pleasant 15°c, reaching a maximum of around 32°c by the afternoon. Low humidity and non-existent rainfall make these months the most comfortable for urban exploration. If a visit during the wet season is unavoidable, it is worth bearing in mind that, although a tropical downpour is guaranteed almost every day, it will tend to arrive at around 2pm and be gone by 4 or 5pm. There are exceptions, of course, and while you can plan your day around the rain, it is always worth carrying an umbrella. Most foreign visitors will need a visa to enter Vietnam. Visa-on-arrival is available at Tan Son Nhat Airport, although this can delay your onward transportation during busy periods. Alternatively, single or multiple-entry visas can be arranged via your local Vietnamese embassy or consulate. Recent legislation changes allow visitors from a select group of countries to visit Vietnam without visa for a short period of time. Read our article dedicated to visas for Vietnam to learn more. Also, be sure to check with your nearest Vietnamese embassy or consulate for the latest visa regulations before booking your trip. Saigon’s Tan Son Nhat International Airport can be reached directly from numerous international destinations including London, Paris, Istanbul, Dubai, Shanghai, Hong Kong, and Singapore. Locally, budget airlines such as Jetstar, VietJet, and AirAsia, run direct flights from all over the region and from all of Vietnam’s major cities. From Hanoi, Saigon can be reached in approximately two hours, for as little as US$25 (one way). The ‘Reunification Express’ is Vietnam’s most famous train service, running almost the entire length of the country from Hanoi to Saigon. The journey takes approximately 35 hours, incorporating either one or two nights onboard, with a range of private and communal cabin options available. A soft-sleeper private cabin bed (with AC) will cost approximately US$80. Most travellers prefer to break the journey up by stopping off at destinations such as Hue, Danang (for Hoi An), and Nha Trang. Visit www.seat61.com, an English website, for all of the latest news, fares and timetables. 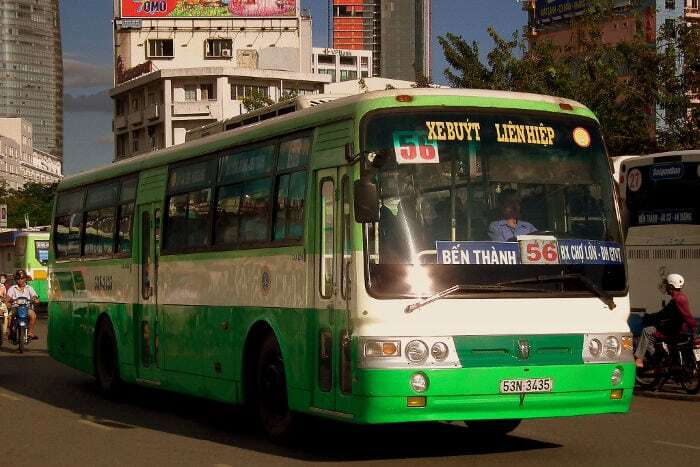 Buses can be used to reach Saigon from all over Vietnam. Prices, quality and drop-off points vary, so be sure to clarify exactly what you are paying for before handing over your cash. For those in Cambodia, the Phnom Penh to Saigon bus route is an extremely affordable (and popular) route for locals and tourists. The journey takes approximately seven hours and drops passengers in the heart of Saigon’s tourist hub. Tan Son Nhat Airport lies approximately 7 kilometres from the city centre. A shuttle-bus service is now in place to ferry passengers from the terminal to the centre of town, a 30 to 50-minute journey costing VND40,000 per passenger (approximately US$2) each way. Another affordable option from the airport is to take a taxi. They are quick, easy and providing you use the correct company, their drivers are very knowledgeable about the city. As you walk through and exit the terminal, do not engage with anyone offering you a cab. Simply follow the signs to find the taxi rank at the front of the terminal. While a variety of cab firms operate in Saigon, the safest and most reliable are Mai Linh and Vinasun. Lookout for their logos, beware of copycats, and simply approach the next Vinasun or Mai Linh in the line (click on the link above to see the logos so that you can recognize them at the airport). Drivers from other firms know the score, so do not worry about stepping past them to get to the cab you want. A taxi from the airport to Ben Thanh Market in the centre of District 1 will cost between VND140,000 and VND200,000 (approximately US$7 to $10) including a mandatory VND10,00 airport charge. The journey takes between 30 and 50 minutes depending on traffic. Be sure to write down the name and full address of your hotel to show the driver. As with arriving at the airport, ignore any offers for taxi or motorbike rides into town. Head to the taxi rank and get into a Mai Linh or Vinasun car. From here to Ben Thanh market in the centre of the city will cost approximately VND50,000 (just over US$2). Saigon’s main bus station sits in the heart of the town opposite Ben Thanh Market. Many popular hotels can be reached from here on foot, or via a short taxi journey costing no more than US$2. Saigon boasts accommodation options to suit all budgets, from the super luxurious to the most basic, in a range of locations around the city. Most travellers, naturally, are drawn to District 1 in the centre of town, where the backpacker hub of Pham Ngu Lao and Bui Vien Streets provide numerous budget hostels and hotels surrounded by tourist-friendly bars, restaurants and nightspots. It is worth checking online reviews first, but many are perfectly clean, quiet and comfortable. Click here to see a large list of hotels in Saigon. 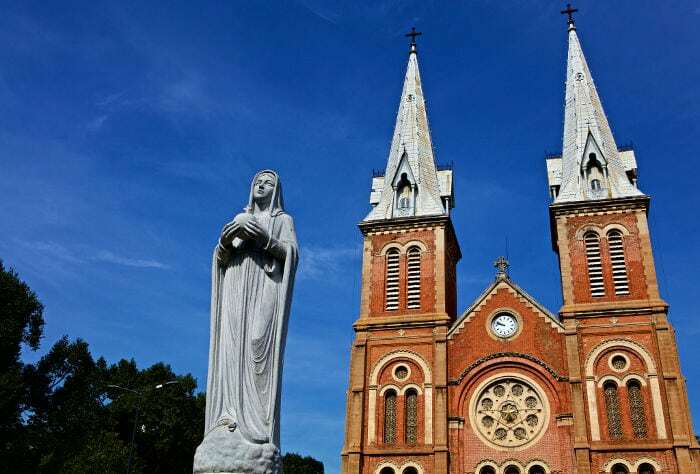 Away from here, Dong Khoi Street, leading from the famous Notre Dame Cathedral to the Saigon River, is another popular location in District 1, particularly for those with a larger budget. Whether you choose author Graham Greene’s residence of choice, the Hotel Continental Saigon, an impressive French-era building overlooking the equally impressive Saigon Opera House, or the modern hotels surrounding it, Dong Khoi is a bustling, vibrant, yet upscale area that’s ideally positioned for exploring the rest of the city centre on foot. For those looking to get a taste of Saigon life away from the tourist hotspots, District 3 is a good choice. Sitting directly adjacent to District 1, it too offers a range of high-quality, comfortable and international standard accommodation options while allowing quick and easy access to District 1 or the more off-the-beaten-track experiences nearby. This modern boutique-style hotel sits on a quiet alleyway (or ‘hem’) running between the popular and lively backpacker strips of Bui Vien Street and Pham Ngu Lao Street. Its decor is a blend of 21st-century design and 19th-century colonial-era features, with all guests enjoying flat-screen TVs, free wifi and friendly, personal service from the hotel staff. Address: 66-68-70 Dong Khoi Street, District 1, Ho Chi Minh City. 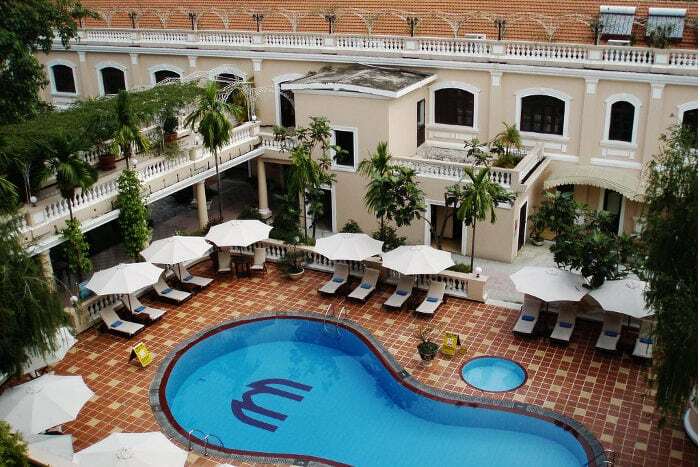 Located in the middle of Dong Khoi Street, Huong Sen occupies one of the area’s many historic buildings, now beautifully restored and featuring a pool and gym, and surrounded by restaurants, shops, bars, tailors, and site-seeing attractions such as the famous Saigon Opera House. Address 76-78 Nguyen Thi Minh Khai Street, District 3, Ho Chi Minh City. As the first five-star boutique hotel in Saigon, Hotel des Arts is one of the city’s most luxurious accommodation options, featuring a rooftop pool and cocktail bar, a fully-equipped gym, and several in-house drinking and dining options. Situated less than 500 metres from the Notre Dame Cathedral and the numerous bars and restaurants on Dong Khoi Street beyond, it’s an ideal base for exploring the city. Vietnam’s currency is the Vietnamese Dong, or VND. At them moment I write, the exchange rate is around VND22,000 to 1 US Dollar. Click here to get the real time exchange rate. Dollars have now been widely phased out in Vietnam. Although some tour companies and travel agencies still quote prices in Dollars, with certain shops, restaurants and hotels also accepting the currency, visitors should expect to pay for most things with Dong. ATMs can be found all over the city, either inside convenience stores, outside banks, or randomly lined up along the street. They dispense dong only. Dollars cannot be bought or sold in Vietnamese banks. Use a private money changer (many can be found near Bui Vien or Dong Khoi streets) to exchange currency. Vietnamese currency comes in paper note form only. 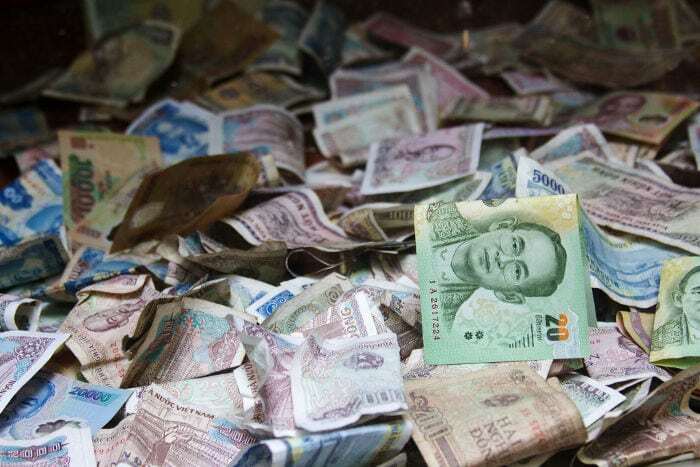 Some notes can look deceptively similar, such as the VND100,000 and the VND500,000. Always make sure you know what you are handing over before anyone assumes you’ve left a very generous tip! With the soaring temperatures and the exhaust fumes from Saigon’s many motorbikes, taking a taxi is often the safest and most comfortable option, even for short journeys of just a few blocks. Use either Mai Linh or Vinasun and simply wave them down at the side of the road. Use other firms at your own risk. Many are known to overcharge tourists or take them on long, unnecessary tours of the city. While Vinasun and Mai Linh drivers have a good knowledge of Saigon’s streets, and will always strive to take the most direct route possible, be sure to have the full address written down. Vietnamese is extremely difficult to pronounce and even the simplest of street or hotel names can be lost in translation. Tips are not expected but for the average hop across town, a few thousand dong will be greatly appreciated. And always carry small notes as drivers rarely carry large amounts of cash. Laying a VND500,000 note on a driver for a fare of just VND20,000 will not be appreciated. Taxi fares in Saigon are extremely low, and even journeys from one end of town to the other can cost no more than US$5. Uber and GrabCar are now in wide use across Saigon, although many users have found their drivers to have little knowledge of the city (despite their GPS systems!). Otherwise known as a “xe om” in Vietnamese (literally translated as “bike hug”), you’ll find these guys on every other street corner, usually, and rather impossibly, reclined back and sleeping along the seats of their bike. Always agree a fee beforehand and show the driver the cash before climbing aboard. While they can be a quick way of hopping around town, they are unregulated and have been known to grossly overcharge tourists, turning, for example, a pre-agreed fee of VND5,000 (around $0.25) into a charge of VND500,000 ($25) at the journey’s end. If you do want to use one, do so at your own risk. While they carry spare helmets, these are often little more than a plastic bowl lined with polystyrene. Vietnam’s roads are some of the most dangerous in the world and general road safety is extremely poor. The recent arrival of GrabBike looks set to turn the xe om industry on its head. If you do want to see the city on two wheels, this is one of the safer options, or, alternatively, take one of the many guided motorbike tours available (see ‘What to do’ below). Saigon has a large public bus system. However, they are hot, they can be crowded, and without any way of knowing where you are, where you’re going, or when your stop is coming up, they are best left to the locals unless you are planning an extended stay. Saigon is an extremely safe place to visit compared to other cities in Europe and Asia. Robberies are very rare, but do happen, particularly in the tourist-friendly areas like Dong Khoi Street, Ben Thanh Market and Bui Vien Street, where bag, camera, and phone snatching is on the rise. “Slash and grab” theft is also an issue, so do take care when carrying bags through a crowd. Several tourists have found themselves with gaping holes in their rucksacks and the contents missing. Checking your smartphone at the side of the road is also inadvisable. Remember, Vietnam is a developing country where a brand-new iPhone, for example, can represent an entire year’s wages for some. Other than that, standard city rules apply. Do not carry large amounts of cash, do not wave your valuables around (especially your phone) be aware of your surroundings and, most importantly, relax! The Vietnamese people are, on the whole, extremely friendly and welcoming and most visitors leave without any issues whatsoever. Also, make sure to get a travel insurance before traveling to Vietnam as, if something happens, hospital fees may be extremely expensive. Located at the top of Dong Khoi Street, at the crossroads with Nguyen Du Street, this large open square is home to two of the city’s most iconic buildings. In the centre sits the magnificent twin-spired cathedral, built from bricks shipped from France in the late 1800s. To the east sits the colonial-era post office, built by the French in 1891. While the cathedral is rarely open to the public, the (still working) post office is worth a trip inside, if only to get postcards and stamps. The original French-built governor’s palace, built in 1873, sat on this site until 1962, when it was badly damaged by an aerial bomb attack and later demolished and replaced by the current building. As the home of the President of South Vietnam until Saigon fell to the North, a visit inside offers a fascinating insight into the history of the city. The private guided walking tour (VND200,00 / US$10 per group) is well worth the additional cost. Located just a few blocks from the Palace, and with an equally long lunch break, this multi-storey museum highlighting the loss and suffering (on both sides) caused by the Vietnam War (or, the American War, as it is known in Vietnam) is a harrowing yet rewarding experience. Given both attractions’ long lunch hours, it is best to visit the Reunification Palace in the morning and the War Remnants Museum in the afternoon (or the other way around), with a lunch stop at Propaganda Bistro nearby (see “Where to Eat” below). What was once a busy, smelly, traffic-clogged boulevard through the centre of Saigon, was opened in 2015 as the city’s first ‘walking street’. With the impressive ‘Hotel de Ville’ at one end, guarded by a statue of President Ho Chi Minh, fountains in the middle, and the breezy riverfront at the bottom, it has become a favourite spot for the people of Saigon to meet and relax of an evening. Enjoy a coffee or meal at one of the many nearby cafes and restaurants. While it is far less hedonistic and far less raucous than Bangkok’s Khao San Road, Bui Vien is the centre of Saigon’s “backpacker town”. With dozens of tourist-friendly bars, restaurants, cafes, nightclubs and shops, it’s easy to see why some visitors rarely step foot outside of its lively confines. A buzzing nightlife also attracts the local Vietnamese crowd who come to enjoy the cheap beer and brush up on their English skills. With designer shops, souvenir outlets, bars, restaurants, cafes, and some of Saigon’s most famous and historic hotels, a visit to Dong Khoi is essential. Another of Saigon’s icons. At 263 metres, 68-storeys, Bitexco is the tallest building in the city. It’s also the most unusual, designed to resemble a flowering lotus bud, apparently. Head up to the Sky Deck on the 49th floor (entrance fee applies) or to the Sky Bar on the 51st-floor, to take in the unparalleled view of the city and beyond. With the magnificent Saigon Opera House at its centre, a stroll around Lam Son Square takes in over a century of Saigon’s history, from the Continental Hotel, the first hotel to be built in the city, to the Park Hyatt Hotel and the site of the former US military building from where the famous “Good Morning Vietnam” Dawnbuster radio show was broadcast. On Saturdays or Sundays, get up early and make your way to Banh Mi Hong Hoa at 62 Nguyen Van Trang, District 1. This is one of the best banh mi vendors in the city. The classic pork and pate combo (banh mi thit) is everyone’s favourite, although their English menu lists several varieties. With your sandwich in-hand, head two blocks north to enjoy it in Tao Dan Park where, among many other early-morning activities, the bird-owners of Saigon meet every weekend to let their birds learn new songs from each other. Find them outside the small cafe in the southeast corner. Take a seat, order a ca phe sua da, and enjoy your breakfast. Spas and massage parlours can be found all over the city. Some are fine, some are not so. A favourite among the expat community is Moc Huong Spa, with two locations in District 1. It’s clean, it’s comfortable, it’s extremely professional, and the complimentary sauna, steam room and showers are a nice touch. A basic one-hour body massage costs VND360,000 (US$18 approx), although for the ultimate indulgence, splash out on a two-hour, six-hand massage (yes, six hands), for VND1,200,000 (US$60 approx). Saigon is well-known for its millions of motorbikes. If you’re feeling left out (and really, the roads are safer than they look, we promise), book a tour with Vietnam Vespa Adventures. Their fleet of professional, friendly drivers will show you the sights, smells, sounds and flavours of Saigon, all led by an English-speaking guide. Their restored vintage Vespa motorbikes are seriously cool, and are surprisingly comfortable to ride pillion. Options range from daytime sightseeing and food tours, to “off the beaten track” trips into the Mekong Delta. If you’re looking for a taste of Saigon’s nightlife, the ‘Saigon After Dark’ tour is a must. Music, theatre and dance performances are held regularly at the Saigon Opera House (officially known as the Municipal Theatre), and are a great chance to see inside this historic building. The AO Show is a regular highlight on their listings. Featuring a blend of acrobatics, circus skills, visual art and dance, it draws inspiration from everyday life in Vietnam, from the fishing villages of the coast, to the frenetic city streets. The Cu Chi Tunnels are a vast network of underground tunnels and hiding places used by the Viet Cong during the Vietnam War. Visitors are able to head deep below ground and explore them, though it’s not for the faint-hearted or claustrophobic. There are a several small museum exhibitions and dioramas, plus a live-firing rifle range if you fancy firing off a few rounds from a range of antique weaponry. Many visitors choose to take a tour bus out to the tunnels, but our favourite way is by speed boat, with Les Rives, an ideal opportunity to see Vietnam’s stunning countryside on the way. With breakfast served onboard during the outward journey, you’ll also arrive at the tunnels well before the tour buses (and the crowds). Saigon’s networks of alleyways (or “hems” as they are known in Vietnamese) can be vast, and are always full of surprises. Don’t be afraid to wander and get lost – they’ll reach a main road eventually. Another interesting way to spend an afternoon is exploring an old apartment block. Many of these crumbling megaliths are filled with hidden treasures mixed in among the residential units, such as boutique shops, bistro restaurants, and quirky hidden bars and cafes. Head inside the block at 14 Ton That Dam, District 1, for one of the city’s finest example of urban renewal. As a hotbed for secret Viet Cong activity during the war, Saigon is scattered with hidden rooms, basements and weapons storage facilities. Head to Pho Binh, an otherwise normal-looking pho noodle soup restaurant at 7 Ly Chin Thang in District 3, and, once you’ve finished your meal, the owner will show you around the secret Viet Cong meeting room upstairs. On the other side of District 3, the narrow house at 287/70 Nguyen Dinh Chieu holds another surprise. Lift the disguised hatch in the floor to find a hidden storage facility for the Viet Cong’s weapons. There’s a small display case with photos and (Vietnamese) descriptions, plus mock weaponry to show how it once looked. It’s small but well worth a visit if you are in the area. It’s free to enter but does close for lunch. 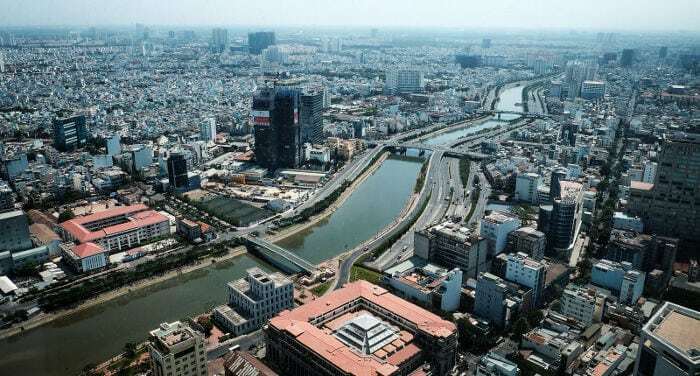 To fully appreciate the melting pot that is 21st-century Saigon, head to the city’s “little Tokyo”, which begins at the crossroads with Le Thanh Ton Street and Hai Ba Trung in District 1. Heading along Le Thanh Ton, away from Dong Khoi Street, find the largest concentration of Japanese shops, bars and restaurants the city has to offer. Head into the alleyway at 17 Le Thanh Ton to enter ‘the Japanese ghetto’ – a maze of karaoke bars, noodles shops and hole-in-the-wall restaurants. When the sun is setting, there’s no better place to be than high up on a rooftop with an ice-cold beer or cocktail. Fortunatley, Saigon has a range of choices to suit every budget. Of the swanky hotels, the Caravelle’s ‘Saigon Saigon’ bar is the least pretentious and the most affordable, especially at happy-hour (see ‘Where to Drink’ below). For the best view, however, head to the Duc Vuong Hotel at 195 Bui Vien, District 1. The rooftop bar is cheap, friendly and wonderfully laid-back. It also has an almost 360-degree view of the city and the shimmering downtown skyline. While Vietnamese cuisine will be the top choice for any first-time visitor to Saigon, the city is home to some superb international eateries, from authentic US barbecue to freshly prepared sushi, Korean grills or homemade Italian fare. With a rapidly expanding expat population, the choices on offer have never been better. All of Saigon’s street food on one menu, under one roof. One of the most popular restaurants in the city, for good reason. It’s cheap, it’s beautiful and the service is efficient and friendly. The oldest pho restaurant in Saigon. It’s a bit of a trip out from the centre of District 1 (maybe 10 to 15 minutes in a taxi) but there are few that can match it in terms of taste and authenticity. For meat-eaters, get the pho bo tai (beef fillet). It’s their speciality. If Hanoi has bun cha, Saigon has bun thit nuong, a bowl of cold vermicelli noodles, grilled pork skewers, crab spring rolls, plenty of fresh leaves and herbs, and topped with a zingy fish sauce. Cooked, sold and eaten on the street, it doesn’t get more authentic than this. A breakfast-time institution. This open-air street diner has been here since 1960 and serves a sizzling skillet of fried pork, eggs, pate, tofu and onions, with a freshly baked bread roll on the side. There’s also a traditional banh mi thit on offer. Arrive early – it closes around 10am. Bo La Lot, a dish of ground beef wrapped in betel leaves, is famous all over Vietnam. 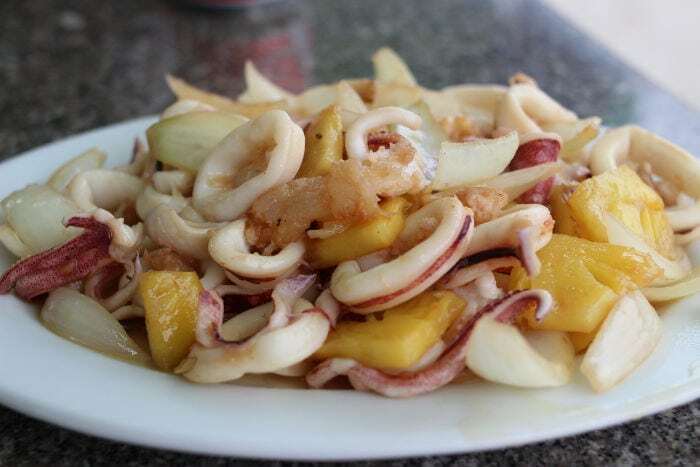 Mrs Lien’s version is considered by many to be the best in town. The music is funky, the wines are superb, and the food a modern take on the Vietnamese classics. Propaganda serves everything from breakfast to lunch, dinner and beyond, in a cool, contemporary environment. Get out of District 1 and head to this lively, modern and semi open-air diner on a picturesque street in District 3. Rico Taco is a favourite haunt of the expat crowd, and for good reason. The food is authentic, plentiful and affordable, and the margaritas are lethal. Quan Ut Ut’s original location is in District 1, but this one is the best. Get out of the city-centre and visit this atmospheric ‘pop-up’ barbecue joint on the banks of the Thi Nghi Canal. There are beer towers, huge wooden picnic benches, and a suitably rocky soundtrack. Oh, and there’s also some of the best barbecue food you will ever eat. Located in the centre of Saigon’s ‘Japan town’, Robata Dining An is a favourite among the huge Japanese population of Saigon, owing to its fresh, delicious and expertly prepared sushi. Other Japanese favourites are available, from grilled meats to soba and soups. Head over the Saigon River to District 2 and this chilled-out restaurant hidden among the thatched roofs and banana trees. The menu is eclectic, ranging from British-style meat pies, to pizza, seafood, and local specialities. This street in the heart of the ‘backpacker district’ is lined with (and surrounded by) bars, nightclubs and curbside drinks vendors. Come happy-hour, it is one of the cheapest places to drink in the city. Whisky drinkers take note: this tiny hole-in-the-wall bar boasts the city’s largest collections of whisky, scotch and bourbon. Staff are friendly and knowledgable and the music is cool and refined (just like its drinks). Saigon has undergone a craft beer revolution over the past few years. Hidden down a dark passageway behind the Rex Hotel, at the top of a narrow staircase, this is where it all started. A reminder of Vietnam’s communist connections, this enormous Czech brewery and beerhall is like a slice of Prague transported to the end of an alleyway in Saigon. For Vietnamese people, drinking and eating go hand-in-hand. This youthful chain of beer clubs springs up in vacant city lots to pump out cheap beer and tasty food. This branch in District 1 is easily accessed from Dong Khoi Street. Don’t be surprised if you leave with a few new local friends. As numerous craft brewers sprang up all over the city, Bia Craft was the first to bring them all together under one roof. This American-style bar is small and cosy and located in District 2 (approximately 30 minutes by taxi from the downtown area). 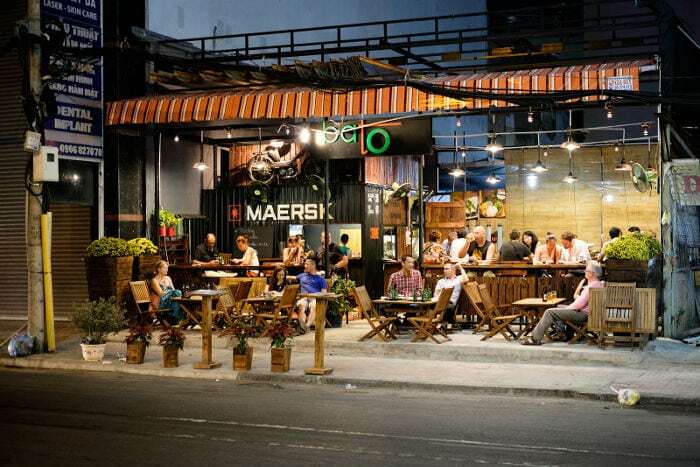 Prefix it with a meal in nearby Mekong Merchant (see ‘Where to Eat’) for the perfect evening in Saigon’s expat hub. The following is a list of basic items you might need to purchase along with a rough guide to their cost. Current US$ exchange rate is around VND20,500. Small bottle of water: VND5,000 to VND10,000 in the street, VND15,000 to VND30,000 in a restaurant. Large bottle of water: VND10,000 to VND20,000 in the street, VND30,000 to VND40,000 in a restaurant. A local beer (Saigon Beer / 333): VND15,000 in a street food restaurant or convenience store. VND20,00 to VND50,000 in a more upmarket or Western-style restaurant. A ca phe sua da (iced coffee with milk): VND10,000 to VND15,000 from a street vendor, VND20,000 to VND50,000 in a cafe. A meal in a street food restaurant: VND20,000 to VND60,000. A meal in a western or upmarket restaurant: VND100,000 to VND 500,000+. A banh mi sandwich: VND15,000 to VND35,000. A pair of “Ray-Ban” sunglasses from a street vendor: VND40,000 depending on your bartering skills. They’ll often start at around VND600,000. Beware, however, that counterfeit sunglasses frequently offer little to no UV protection. Postage stamp to Europe: VND12,000. Available only in post offices. The Vietnamese island of Phu Quoc is less than an hour’s flight from Saigon. It’s a favourite weekend destination for the expat crowd and some of its beaches are simply breathtaking. Whether you go scuba diving, hiking or simply spend your days on a lounger with a cocktail in one hand and a book in the other, it’s easy to see why Phu Quoc is so popular. For Saigon’s nearest beach resort, head to Vung Tau, accessed via the Saigon River on a funky Russian hydrofoil which departs several times a day. Its beaches are nowhere near as pretty as Phu Quoc, and it caters largely to the local crowd, hence some very mixed reviews from foreign tourists. The beach resort of Mui Ne can be accessed via train or bus in less than half a day. It’s popular with kite-boarders and windsurfers, or those that just want to chill out, and boasts all sorts of accommodation options from the dirt-cheap to the uber-luxurious. The Nam Cat Tien National Park lies approximately 150km from the centre of Ho Chi Minh City and can be accessed by public bus or private car in approximately 3 to 4.5 hours. The park hosts an abundance of wildlife, including crocodiles, tropical birds, and a small (endangered) population of gibbons. A variety of accommodation options are available both inside and outside the park perimeter, from riverside bamboo bungalows, to traditional communal houses. Visitors to the area can enjoy hiking, mountain biking, kayaking and guided wildlife tours. Be sure to visit the gibbon sanctuary and primate rescue centre on the park’s eastern boundary. Used as a French “hill station” in the colonial era, the city of Dalat’s cool, mountain air, lush pine forests and positively chilly weather is a great way to cool down after visiting Saigon. Numerous tour companies operate hiking and biking tours of the surrounding countryside which is dotted with hillside farms and coffee plantations. More adrenaline-packed activities such as mountain biking and canyoning are also on offer. From Saigon, Dalat can be reached in approximately 8 hours by bus, or 50 minutes by air. The road from Saigon to Phnom Penh is a daily stream of travelers hopping between the two cities on the various bus services in operation. Despite being so close, Phnom Penh is a very different city to Saigon and is well worth a visit if you have time. Take note, unlike Vietnam, the dollar is very much the main currency in Cambodia, although for anything under a dollar the local currency (riel) will be used. Money changers on Dong Khoi Street, in Saigon, will be more than happy to sell dollars before you depart, although all ATMs in Cambodia dispense it too. Very informative and helpful. Thank you for the information.